September 1, 1949 – At the end of August the Chicago Daily Tribune carried a report on the death of noted landscape architect, Jens Jensen. Oops. Wrong guy. It turns out that a 65-year-old Door Country, Wisconsin resident with a similar name was the guy who rode the Great Skyway and not Mr. Jensen, who is alive and well in his home in Ellison Bay. Taking advantage of the error, the paper publishes a flattering piece on the contributions of Jensen, who came to the United States from Denmark in the early 1890’s and began work as a laborer in the west parks system of Chicago, going on to be one of the premier landscape architects of the twentieth century. “Jens Jensen had a simple set of precepts,” the paper observes, “which he clung to stubbornly in the face of both politicians and millionaire clients, and defended with the rage of an inspired Viking when aroused. He believed in the beauty of nature. He detested formal gardens. He taught the middle west the value of its native trees and plants in landscaping.” [Chicago Daily Tribune, September 1, 1949] The article continued, “To him, parks were placed where city people should find the comfort of natural beauty. They were not for batting baseballs. Neither were they automobile speedways. In his judgment, 15 miles an hour was fast enough for people entering the parks to enjoy the lawns, the crab apple blooms, and the hawthorns. In a day when efforts are made to encroach on the parks for almost every other public use, a revival of the Jensen principles would be a healthy thing for Chicago.” Perhaps Jens Jensen's greatest work in Chicago is Columbus Park, shown in the photo above. September 1, 1925 – Two days after the South Water Street market closes for business, the Chicago Daily Tribune rails against the street that will replace it, specifically the fact that the new road along the river will be named after Charles H. Wacker, the head of the Chicago Plan Commission. “It is small town stuff at its worst,” the paper proclaims, “to rename South Water street because it is double decked and remade . . . We certainly acknowledge Mr. Charles Wacker’s civic spirit and his useful service in the protection and realization of the city plan . . . But to give his name to the chief thoroughfare of the city, after Michigan boulevard, is not only crude vandalism, but without fitness of proportion. Mr. Wacker has been a useful citizen, but his service in the city does not tower above that of all other citizens . . . what of Daniel Burnham, who was the creator of the city plan, one of the most famous and gifted of our citizens? 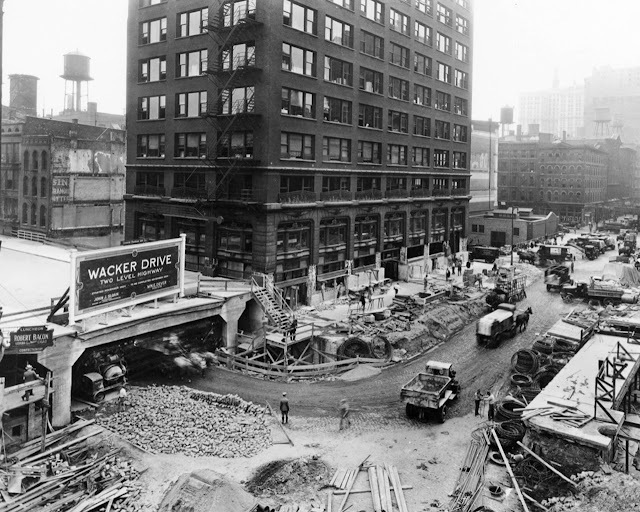 If we give Mr. Wacker’s name to our second greatest street, how are we going to honor Burnham with any respect for proportion?